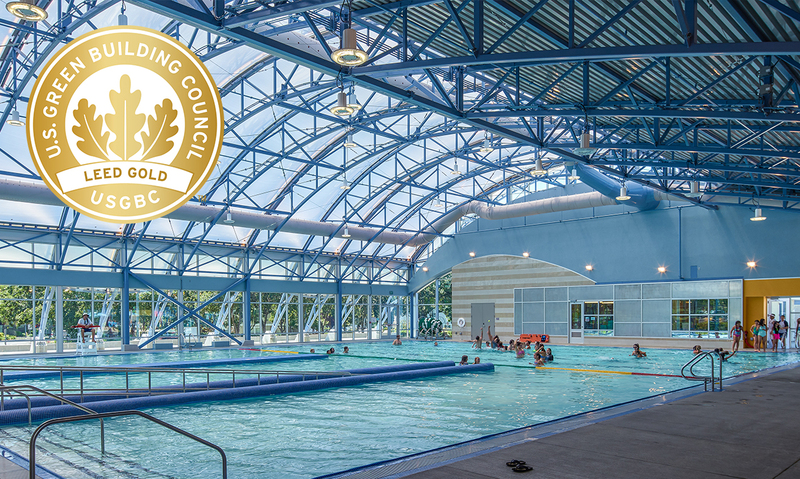 The recreation and aquatic complex at Emerald Glen Park, known as The Wave, achieved Leadership in Energy & Environmental Design (LEED) Gold certification. With an original design goal to meet LEED Silver standards, DAHLIN’s collaborative design process with the City of Dublin led to many energy- and water-conserving features, exceeding the original goal while also ensuring efficient facility operations and minimizing long-term maintenance costs. Solar energy to heat the water in the Natatorium pool. High-efficiency LED lighting throughout the facility. Variable speed motors for the pool water circulation equipment. Drought-tolerant landscaping with a state-of-the-art irrigation system. Low flow fixtures to minimize potable water use. Infrastructure for up to 10 electric vehicle-charging stations.